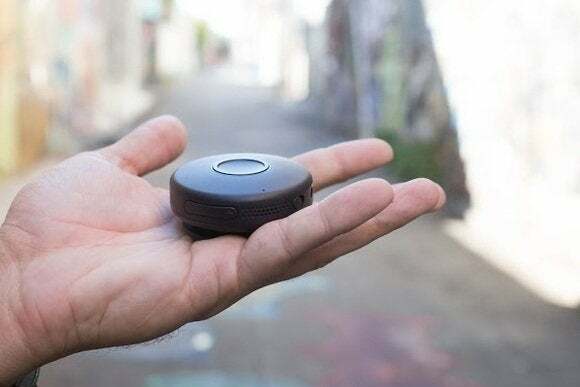 A hardware startup called OnBeep is doing its best Star Trek imitation with Onyx, a clip-on communicator that works over any distance. The Onyx is a palm-sized orb that clips onto a lapel, sleeve, or bag strap. It has a built-in speaker and a big button in the middle for activating the device’s microphone. When connected via Bluetooth to a companion iOS or Android app, it lets a group of users communicate over the Internet with either a Wi-Fi or cellular connection. OnBeep is taking pre-orders for the Onyx now and plans to start shipping by year-end, though the company isn’t promising delivery in time for the holidays. A single Onyx will cost $99, and a pair will cost $195, but app and service are free. Why this matters: Eyes-free, push-button cellular communication has been done before—most notably by Nextel around the turn of the century—but no one’s managed to modernize the concept for smartphones. That’s what OnBeep is attempting to do, with a device that works across different networks and operating systems. While we haven’t yet seen the Onyx up close, it doesn’t seem like there are any glaring gotchas. OnBeep is promising high-quality, low-latency audio with no limits on how many people can be in a group, and the company says Onyx will work fine as long as it’s placed above the waist. As for battery life, OnBeep claims that the Onyx will last through at least 12 hours of active use, which involves around 10 to 20 communications per hour. Robbins said the company has seen instances of longer battery life, but doesn’t want to overpromise. The device charges through an included micro-USB cable. OnBeep’s Onyx has a microphone, speaker, silent switch, volume controls and headphone jack. Users who want to keep communications private can plug in headphones through the device’s included headphone jack, but there’s no wireless option for now. OnBeep has considered adding support for Bluetooth headsets, with the Onyx’s button still acting as the voice gateway, but Robbins didn’t give a timeline. After launch, OnBeep will be working on premium features that it can sell within the app. For instance, some users may want additional security or archival features, along with tighter controls over who can invite new members to a group. (Right now, anyone in a group can invite anyone else.) In general, the company is still thinking about ways to branch out, and while Robbins wouldn’t rule out video-based products, he said it’s currently a huge challenge given the constraints of mobile devices. Why hasn’t anyone done this before? Robbins says Onyx was only made possible recently through the maturation of Bluetooth, faster wireless data connections and new ways for hardware startups to get to market.